Sometimes you need Jeremy Clarkson: “Jaguar Land Rover delivery people: Don’t come to London to pick up the iPace tomorrow. I couldn’t charge it so it’s not there,” he tweeted. He could have phoned them. It was his way of drawing attention to the electric fervour engulfing car people. The virtue-signalling of spin doctors pleading with us to embrace batteries. It’s pure hype. Jeremy was drawing attention to exaggerated expectations. The motor industry is frantically claiming electric credentials; it is beside itself with assertions of an electric revolution. That 2 to 4 per cent is touted to appease politicians searching for green votes. The industry is desperate to avoid bans. Jeremy doesn’t like electric cars. I don’t mind electric cars. I could put up with one for a 50-mile commute. But I would need a proper car for serious journeys. I could live with a hybrid. I’ve driven plenty like the Vauxhall Ampera and they’re fine. I like a combustion engine charging a battery, a principle well established. The 1933 Fliegender Hamburger 2-car train ran the fastest timetabled service in the world, 77.4mph Berlin to Hamburg. It had two 810bhp V12 Maybachs driving Tatzlager electric traction motors. Diesel-electric ships and submarines, gas turbine electric, hybrid buses, trucks earth-movers – there was even a prototype hybrid tank in the Second World War. So – hybrids OK but let us stop pretending that battery electrics are realistic. Batteries are better than they used to be; regenerative braking works a bit, but the Nisssan Leaf takes an hour to charge and has a range of 168 miles. Advertisers prefer 270kms, which sounds farther. It still faces the practicalities Camille Jenatzy found with his electric land speed record La Jamais Contente of 1899. It could go a short way quickly or a long way slowly but not both. Jeremy’s Jaguar i-Pace’s official WLTP range is 298 miles. Top Gear’s Paul Horrell tried to take one to Land’s End from London (291 miles) and even keeping under 50mph had to find a charging point 78miles short. He managed it, “only by crawling along, denied heating, air-conditioning, stereo, head-up instrument display, lane-assist, wipers and headlights.” He thought the real-driving range below 200 miles. We are not ready for battery-electrics. Instead of spending money on charging points we ought to be looking at hydrogen, which would please everybody. Fuel-cell cars really are zero-emission. They are silent, safe and long-range. 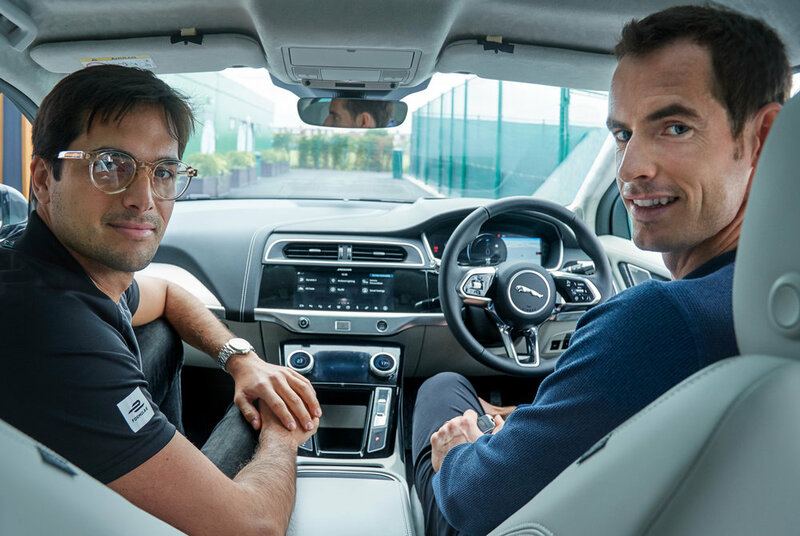 Nissan Leaf (left) Charging point (middle) Nelson Picquet and Andy Murray in Jaguar i-Pace. If politicians want to be seen to be doing something they can look at the Motoring Research analysis of plug-in hybrids. That showed they are 90mpg short because lazy drivers were not charging their batteries. They run plug-in hybrids for tax-saving benefits, rather than economy and are using fuel about the same as any petrol-engined car. “Many drivers may never have unwrapped their charging cables,” according to Cheshire fuel management firm’s Paul Hollick. More than 7 in 10 of the 37,000 plug-in hybrids sold this year have been to fleets. Companies have given them to high-mileage motorway drivers, so average fuel consumption is just 39.27mpg, compared to a possible 129.68mpg.